AMD Ryzen 5 1600 & Asus AMD PRIME B350-PLUS Mobo & 2 FREE Blockbuster Games £238.96 at Ebuyer. Ryzen 5 1600 is currently £158 at Ebuyer and if you add the ASUS Prime B350-PLUS Mobo at £80, I believe this DIY combo will allow you to claim the 2 blockbuster games from Asus. is this a good price for the ryzen? also what clock speeds can u get this to? is this a good price for the ryzen? also what clock speeds can u get this …is this a good price for the ryzen? also what clock speeds can u get this to? This is a very good price for the 1600. I built my PC a few months ago and the 1600 was around £200 at that point! This is a very good price for the 1600. I built my PC a few months ago and …This is a very good price for the 1600. I built my PC a few months ago and the 1600 was around £200 at that point! Your mileage may vary with that Asus Prime B350 board, it lacks any VRM heatsink so it wouldn’t be wise to go hard on overclocking with it. The Strix B350 likely will cost more, but it’ll also be a much better buy. 3.7GHz maybe 3.8GHz is realistic considering the board and the cooler. 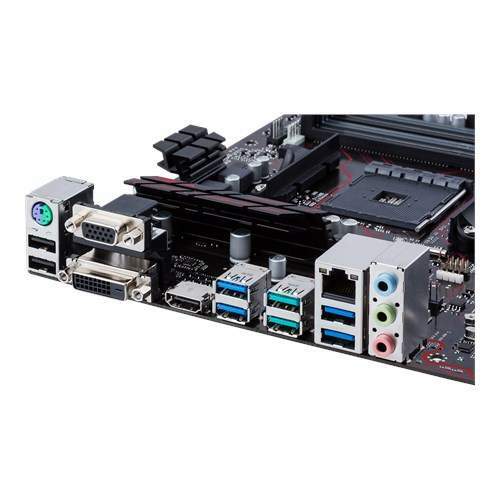 Your mileage may vary with that Asus Prime B350 board, it lacks any VRM …Your mileage may vary with that Asus Prime B350 board, it lacks any VRM heatsink so it wouldn’t be wise to go hard on overclocking with it. The Strix B350 likely will cost more, but it’ll also be a much better buy. This is the the "Plus" version of the B350 which I think has VRM cooling. Not an expert, maybe someone can confirm? This is the the "Plus" version of the B350 which I think has VRM cooling. …This is the the "Plus" version of the B350 which I think has VRM cooling. Not an expert, maybe someone can confirm? Yes it does. It's even designed with a stock cooler in mind. Yeah, seems it does. Too many similar names boards knocking around. Good deal, only one question, do we need to contact ebuyer for the promotion code or do they send it? I bought the 1600 with the Asus strix B350 earlier and haven't received anything by way of code for the promotion. I pulled the trigger on this earlier once I saw they had matched competitor pricing on the CPU, as the mobo seemed well priced at under £80. The games swung it for me (as above interested to know how we get the code). Wasn't impressed with their pricing of RAM though so I went for 16GB 3000mhz from OcUK at £149.99, bit annoying having to pay so much for RAM these days which outweighs any savings on the other bits. I pulled the trigger on this earlier once I saw they had matched …I pulled the trigger on this earlier once I saw they had matched competitor pricing on the CPU, as the mobo seemed well priced at under £80. The games swung it for me (as above interested to know how we get the code).Wasn't impressed with their pricing of RAM though so I went for 16GB 3000mhz from OcUK at £149.99, bit annoying having to pay so much for RAM these days which outweighs any savings on the other bits. I'm almost certain I know which RAM kit you got for £150, and all I'm gonna say is they had at £120 about a month or so ago (and I bought it). Yep and a year ago could have got equivalent for well under £100 I expect. Annoyingly I nearly bought some DDR4 ages ago when it was about £4/GB but decided to wait until I upgraded the mobo and CPU. Was tempted to get just 8GB now in the hope that prices will fall again and then add more but it's not guarenteed of course. Can you flog the codes on eBay afterwards to get a bit of money back? Recently flogged my old motherboard and i5 for quite a good price to try out Ryzen! Good deal, only one question, do we need to contact ebuyer for the …Good deal, only one question, do we need to contact ebuyer for the promotion code or do they send it? I bought the 1600 with the Asus strix B350 earlier and haven't received anything by way of code for the promotion. you need to be careful when it comes to selling these i remember a load of codes being banned for people doing that. That's not what the instructions say though, you have to get a code from the retailer that you then submit to Asus.